« What to do with Earth / Mud Mortar Walls? Note: I’m currently looking in to, what problems might be caused by not sealing the top of the liner to the plate. So keep checking back, leave a comment below (wordpress should be able to email you when I’ve added to this post) or join us on facebook for updates. You’ll see from the previous Chimney Jenga Post that our chimney stacks have shifted a little. This occurred quite a while ago, probably pre Victoria if the construction of the wall built to hide it is a guide. Now the scaffolding is up Stuff Doer has discovered a rather cheeky effect on the chimney pots that we had been unaware of. The five foot high pots have been giving the “Vs” to Whitby for years. You’ll be pleased to hear our cottage is now more respectful of it’s surroundings since the builders have been up and installed the liners and re-sited the pots. How the Stuff Doer got those photos is beyond me. He’s not allowed on the roof!!! This entry was posted on Tuesday, February 12th, 2013 at 1:22 pm	and is filed under I do DIY stuff, I do PROPERTY stuff, Whitby Cottage. You can follow any responses to this entry through the RSS 2.0 feed. You can leave a response, or trackback from your own site. Hmm, I’ve also noticed the gratuitous “view” shots on the video. For builders they make bloomin good cameramen!!! Having watched your video with much interest, I am contemplating installing a flue liner for a wood burner myself. I live up North, Sale, and would like to pass a little info to anyone attempting to install a wood burner themselves in this area. For the privilege of doing said work my self, the local council require a fee of £405.52p how they can justify this is beyond me. So, people from Sale beware, the council is out to bleed you. Hi Len, That is absolutely outrageous!! It could be worth having a look at what other councils charge. I had around £160 in my head. And then challenge their price. Great video & interesting article. Thanks for the informative descripts and vids. Have you put together the info for fitting register/closure plate? very keen to see this. Hi Antony, Appologies for the late reply. They are in the pipeline. Hi, Thank you for a very informative video. I live in a bungaloe with strtaight chimney lined with round teracotta liners..there is no register plate, can i fix the flexible liner directly from thr pot on the chimney to the stove. ….is a register plate necessary? 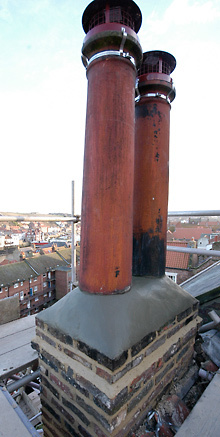 12 years since we fitted a 6″ flexible twin wall s/s liner to our chimney for our wood-burner. We had put in 9″ clay liners when we built the house, but put s/s flexi-liner in for belt-n-braces approach, and better draw on fire. Pulled liner up, used pot-top hanger fixing, with no insulation, cowl on top to keep rain out and stop downdraft from nearby trees (when wind comes over them it drops down toward the chimney). We left an airway from register plate up thru chimney which has kept it dry and aired between s/s flexi & clay liners – never been any trouble. We wouldn’t be without our woody. Hi James, Sounds like a good job you did there should give you many more years of trouble free burning. It may be that you don’t need an additional liner at all. If the existing teracotta liner is in good condition you should be able to connect directly to it. Although liner may may improve the draw through the stove as the flue would not take so long to warm up (only a small benefit). When using a liner the register is only needed to keep the warm air in room and to stop old soot and debris falling down. 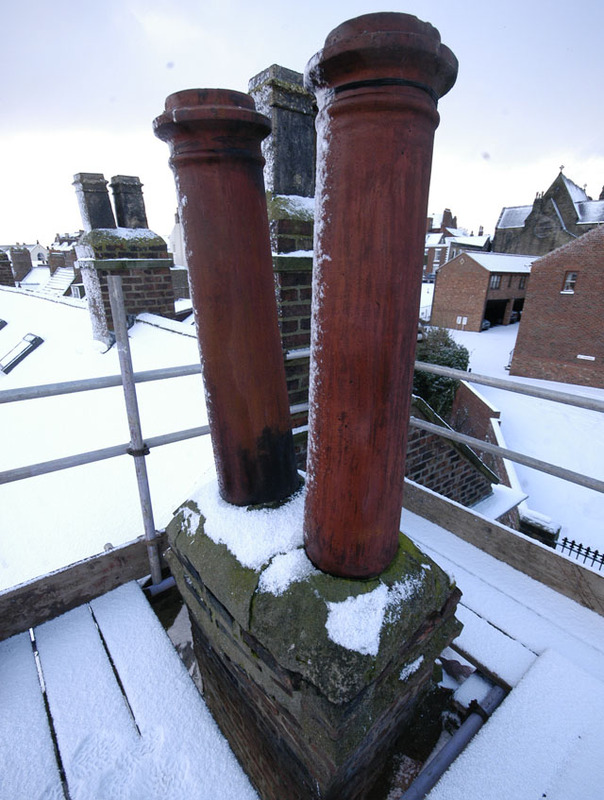 Can you please advise regarding the fittings etc that I need for the following:- My chimney stack has previously been removed and ends in my loft space about 12 inches below the roof. I assume the liner will need to be fitted as per your video, but what do I need to go through the roof and terminate? I have just replaced my 316 liner with 904 after 12 years of burning rubbish (not very well seasoned) wood – liner partially disintegrated. My last liner wasn’t signed off by anybody and this one probably won’t be either as I think my work is quite competent (famous last words ha ha). Anyway, what I would like to know is when fixing the regisfer plate above the burner, you use a heatproof flexible sealant between the register plate and the flue. What is the sealant called ? All of the sealants I can find dry solid. I used fire cement on my previous installation and as expected it cracked and let the ingress of dust onto the stove top occasionally. I’d be grateful for a prompt reply as my missus wants the mess sorted asap and the stove back in working order before the weather gets too much colder. Apologies for the late response, I’m getting loads of spam comments and don’t always spot the genuine ones straight away. You could use solid stainless twin wall sections for the last bit, all the parts, brackets, roof flashings and cowls are available. Special care has to be taken to keep any roof timbers at a good distance. Please check all the regs, manufacturers instructions etc. Trying to find some information. Is it completely necessary to have a pot? Could I attach a cowling directly to the top of the flexible pipe? Hi Jules, Appologies for the late response. If you haven’t got a pot then a length of solid twin-wall stainless flue pipe is an alternative to get sufficient height above your roof and they make cowls to suit. I suppose in raw cases where the flexible liner is enclosed in the stack up to the right height then a pot hanging cowl could have the outer straps cut off so it fits flush with the top of the stack. I you aren’t sure, please get advice from a professional who can asses you particular circumstances. Access to roof is difficult. However the attic is easy is it possibly to open up chimney internally and flue line to the fire Atari a custom plate then solid pipe up to chimney pot. The joining plate creating a seal between both flex and solid and Also the chinmey cavity itself. Hi Andy, Thanks for your great site and advice. I am in semi-rural Bedfordshire and know that an awful lot of rural cottages and houses have gone down the wood-burner route. I very much doubt that many of them have shelled out the eye-watering amounts that research suggests costs to put in a sleeve. I am at that juncture myself, having noticed bits of mortar on the last clean. I will probably have to get a HETAS guy in, but wholly disagree with their website statement “Owning and maintaining a solid fuel appliance requires a significant investment in both time and money”. I intend to take the matter up with my MP as I see the arrangement as anti-competitive. Wood burning is often in lieu of unaffordable central heating in the Shires. We should not be held to ransom. A sweep has damaged my 3 year old flexible flue liner by using the wrong rods. I know this as my flue was still blocked after 2 visits so I had to get another sweep in and we put a camera up the chimney to see what the blockage was. Do you know where I could get advice on the flue damage, which I have photographs of? Hi Chrissie, apologies for the late response. Not enough info really to give advice, how is the liner damaged and blocked? Can the second sweep give you advice? Hi Dave, apologies for the late response. There is a little more competition in the installer accreditation market now (not just HETAS) so things might ease up a bit (APHC, BESCA, Certsure, HETAS, NAPIT, OFTEC, Stroma). The other route is use your local Authority building control to cert the work of builder or yourself. Although they charge quite a bit as well! I do sympathise with your sentiments on the “closed shop – monopoly” arrangement that HETAS seems to promote but do bear in mind that there are many good honest accredited installers out there that that wont rip you of but do need to make a living from their time, experience, cost of accreditation, liability insurance etc. As always get a few quotes, but still be prepared to have to bite the bullet on this one.